Without both the material fragments and spiritual letters no artist could have done what Alma-Tadema has done – reconstructed not only the ‘buried cities,’ but raised their denizens from the grave. Many artists linked to the classical revival depicted their subjects from a detached perspective; their studies were often far removed from their contemporary audience. Sir Lawrence Alma-Tadema, on the other hand, excelled at depicting periods of ancient history, whether it was the Merovingians, Egyptians, Greeks, or Romans. He did so in a way that they were shown as participants in understandable activities. Many people saw in his pictures their own origins, finding scenes of the past models for this Victorian period of English history. At the same time, Alma-Tadema placed his subjects in settings that were architecturally specific and often based on his own extensive studies. His success during his lifetime was enormous, but as the century came to a close and World War I began, the merits of his work became those aspects which were most often reproached. Still, his luminous compositions with their luxury of detail show an artist keenly aware of both modern day attitudes and the lifestyles of the ancients, a formula which introduced a new kind of art to England and the European continent. Lourens Alma-Tadema was born on January 8, 1836 in a small Dutch village named Dronrijp. His father, Pieter Tadema, was the village notary at this time, and an accomplished musician. In 1837 the family relocated to the nearby town of Leeuwarden where Pieter’s position as a notary would be more lucrative. But Pieter died shortly after on September 8, 1840, leaving his wife to support their two natural children in addition to three stepchildren from his previous marriage to her sister. Lawrence was just four at the time of his father’s death. It was already at this young age that Lawrence began drawing, an activity that was denied by his father and subsequently by his godfathers who felt it their duty to respect the wishes of their late brother. Early on Pieter expressed his desire that Lawrence pursue a career as a lawyer, but he had absolutely no interest in this. As a compromise, his music teacher suggested that he train as a musician, but he still tried to nurture his precocious artistic talent by painting at every opportunity. Thankfully, his mother had her own artistic inclinations and enrolled Lawrence’s older brothers in drawing lessons. Later, Lawrence joined them and drew his first picture, a caterpillar on some leaves. Another one of his earliest drawing is that of some tulips dated June 1st, 1846. Twenty-six pencil drawings also survive from this period and depicted the gods and goddesses of Greece. His artistic abilities already apparent, he was given his first commission in 1849 for a portrait of a family, arranged by the daughters of the family and done in secret. This was a fortunate commission since the father of this family was also the President of the Society for the Promotion of Painting and Drawing in Leeuwarden. This same year he also completed a nother commission and a po rtrait of his sister which was finished the following year and accepted into an art exhibition in the same city. By 1850, he had also produced a portrait of his sister and a self-reflective portrait of himself. The schoolchildren would joke that he was carrying himself under his arm when he had to transport his painting around. Despite his artistic propensities and viable talent, he was still required to attend regular schooling. He was a diligent student, but was only truly interested in his history and drawing classes. He maintained a busy schedule, rising early in the morning to work on his paintings after his mother awakened him by pulling on a string that was attached to his toe, attending classes, and studying music. Most of his pocket money would be spent on books that he added to his growing collections, one of which was How to Become a Painter by Leonardo da Vinci. These books led to his talent for drawing architectural settings and adherence to a strong sense of perspective throughout all of his works. His busy schedule wore him thin, however, and he eventually suffered a breakdown and was diagnosed as consumptive. Both the doctors and his family assumed that he had only a short time to live, perhaps not beyond his twenties, and thus they left him to do what he wished, which was to paint. This gave him a ripe opportunity to concentrate solely on improving his painting technique. Free from any other obligations, he began to train himself to become a true painter while recovering from his illnesses. Still in Leeuwarden, where there were few qualified painters, Alma-Tadema was forced to search elsewhere for his artistic education. He applied to a number of schools which rejected him, but was finally accepted at the Royal Academy of Antwerp; a step up from most of the schools that had refused his acceptance. He began his studies in 1852, at the academy, which at that time headed by Baron Gustave C. Wappers, an intense patriot who dismissed foreign influence on Belgian art. Neo-classical art that had flourished in previous decades was not to be taught, and any classicism that lingered was not to be promoted. However, six months after Alma-Tadema began his studies, Wappers resigned. Alma-Tadema continued at the academy until 1856, at which point he gave up his studies to complete a commission that was given to him. He was forced to resign as a student since the commission required him to be absent from classes for more than three weeks. This also meant automatic expulsion. Instead of remaining at school, he took the commission and never returned as a regular student, aside from some special classes in which he eventually enrolled. Before leaving school, Alma-Tadema had moved into the house and studio of the painter and professor Louis Jan de Taeye, with whom he stayed for three years. Alma-Tadema became his studio assistant and worked with him with on many of his compositions. De Taeye introduced him to books that influenced his desire to portray Merovingian subjects early in his career. De Taeye also recommended him for membership in the Cercle Artistique of Antwerp, one of the most prestigious organizations in the city. Alma-Tadema left de Taeye’s studio in November of 1858 returning to Leeuwarden before settling in Antwerp. Even as a young man he worked assiduously to make the most of his paintings, often times reworking one part repeatedly before he found it satisfactory. One humorous story follows that one of his paintings was rejected and instead of keeping it, he gave the canvas to a maid who used it as her table cover. He was sensitive to every detail and architectural line of his painting, as well as the settings he was depicting. For many of the objects in his paintings, he would depict what was in front of him, using fresh flowers imported from across the continent and even from Africa, rushing to finish the paintings before the flowers died. It was this commitment to veracity that earned him recognition but also caused many of his adversaries to take up arms against his almost encyclopedic works. While in Antwerp, he began working with the painter Baron Hendrik Leys, whose studio was one of the most highly regarded in Belgium. Leys was looking for someone experienced in architectural perspective to assist him with a commission for murals in the Hotel de Ville in Antwerp. Alma-Tadema was perfect. He undertook this extensive work alongside Leys, which occupied much of his time until September of 1863. Before beginning his work with Leys, during the mid to late 1850s Alma-Tadema treated Merovingian subjects as well as scenes from Netherlandish history. He also began working on Egyptian subjects after he and de Taeye read some work on the archaeological excavations that were taking place in Egypt. As in all of his work, and a characteristic that was established from the earliest points of his career, Alma-Tadema was chiefly concerned with architectural accuracy, often including objects that he would see at museums - such as the British Museum in London - into his works. He also read many books and took many images from them. Later in his career he amassed an enormous number of photographs from ancient sites in Italy which he used for the most precise accuracy in the details of his compositions. While he explored early themes of the Merovingian and briefly Dutch history and constructed genre scenes, Alma-Tadema gained his recognition through work based on the everyday life of Greece and Rome. One of his earliest and most well known pieces completed while under the tutelage of Leys that focused on this type of classical scene was The Education of the Children of Clovis painted in 1861. Leys unfortunately compared his marble to cheese, which led Alma-Tadema to improve his technique and to become one of the most gifted painters of marble and granite. Despite any reproaches from his master, it was honorably received by critics and artists alike and was eventually purchased and subsequently given to King Leopold of Belgium. In 1861 Alma-Tadema left the country for the first time and traveled through Germany where his interest in Merovingian history scenes was infused with new inspiration. He also traveled to London when he was twenty-six, visiting the International Exhibition. Apart from seeing the Exhibition, he also took time to visit the British Museum where he saw the Elgin marbles and studied the Egyptian works on display. He continued his travels into 1863, in which year he was married and honeymooned in Italy. His creativity was further awakened when he and his wife journeyed to Pompeii, which had just begun to be excavated more fully that year. These excavations began to uncover aspects of daily life from Roman times that had previously not been known, ranging from what they wore to what activities were engaged in when the volcano erupted. Alma-Tadema was fascinated by these discoveries and this inspired much of his work of the coming decades. After absorbing the archaeological and architectural aspects of Italy, he and his wife returned to Antwerp at the end of the year, traveling via Paris to view his first painting entered in the Parisian Salon, Pastimes in Ancient Egypt (18th Dyna sty), where it was given a gold medal. Already aware of the value of his own work, he refused an offer for 3000 francs for the painting from Napoleon III, since he believed it was valued at 4000 francs. Besides enjoying the French capital for the first time, and receiving a medal at his first Salon showing, Alma-Tadema also met Jean-Leon Gérôme who taught Alma-Tadema a formula for painting which he would employ the rest of his life. 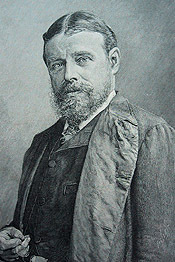 After returning to Belgium, Alma-Tadema was put in contact with the established and influential art dealer Ernest Gambart. One account says that a friend of Alma-Tadema’s gave Gambart’s carriage driver the wrong address, sending him to Alma-Tadema’s studio instead of another artist’s, whose studio Gambart had originally meant to see. Alma-Tadema was waiting for him upon his arrival. As the story continues, Gambart was so impressed with Alma-Tadema’s work that he bought a painting that was being completed for another client. He also commissioned twenty-four paintings from the artist, establishing security for him and his family. With this new found stability, Alma-Tadema decided to move his family to Brussels where he could be closer to Gambart. By the end of May 1865, they had made their residence there and he began immediately decorating his studio. This is also the same year that he fully began his series of Greek and Roman paintings, showing an early propensity towards darker tones with more elaborate detailing, even more so than his later works. In October of this same year he won the Knighthood Order of Leopold at the Exposition General des Beaux-Arts in Brussels with Preparations for the Festivities. This award solidified his public fame and artistic standing. Nevertheless, continued exposure was the recipe for Continental appreciation, and Gambart took the initiative, entering thirteen of his paintings in the 1867 Exposition Universelle in Paris. His Salon picture of 1864, Pastimes in Ancient Egypt 3,000 Years Ago – renamed – received the second-class medal. After three and a half years Alma-Tadema had fulfilled his contract with Gambart, completing his last commission in October 1867; thirty-four paintings in all. However, Gambart continued their relationship and offered him a second and more lucrative contract for another forty-eight pictures. Gambart continued exhibiting Alma-Tadema’s pictures at every opportunity. He entered two paintings in the 101st Royal Academy Summer Exhibition in London. Despite praise from virtually every critic, John Ruskin, one of the leading British art critics of the era, established a lifelong antipathy towards the Classical revival works that were Alma-Tadema’s forte. Unfortunately, his residence was destroyed when a barge exploded along the Regent’s canal, causing destruction to many of the residences. He later bought Tissot’s house as a replacement. Alma-Tadema was, at that time, the only artist in England to paint archaeologically oriented domestic antique genre. Others of the Classical School felt that his presence in England strengthened their own Neo-Classical position in the Royal Academy. […] The Art Journal saw him as 'The bright painter whom everybody admires... the public for his triumphs of technique and his brothers for the legitimate means by which these triumphs are compassed.’ England had never wholeheartedly accepted strict Classicism, but from about 1864, the year Leighton became an Associate of the Royal Academy, a strong movement in the Classical direction began to gather momentum. While making acquaintances with many of the British artists, Alma-Tadema continued to show his compositions and continued working on those commissions from Gambart. In March 1874, he completed three pictures that were shown at the Royal Academy in April. One of these, A Sculpture Gallery, was exhibited in November at the Berlin Academy where it was awarded a Great Gold Medal by the German Emperor. Additionally, this painting and another were so well received that they led to his election as an Associate of the Academy in London in January 1876. The previous year he and his wife began a journey on the Continent that spanned five and a half months and took them through Brussels, Germany, and Italy. In Italy they were able to take in the ancient ruins again, this time he purchased several photographs, mostly of the ruins, which began his immense collection of folios with archival material sufficient for the documentation used in the completion of future paintings. In January 1876, he rented a studio in Rome. The family returned to London in April, visiting the Parisian Salon on their way back. On June 19th, 1879 Alma-Tadema was made a full Academician, his most personally important award. Three years after this a major retrospective of his entire oeuvre was organized at the Grosvenor Gallery in London, including 185 of his pictures. In 1883 he returned to Rome and most notably, Pompeii, where further excavations had taken place since his last visit. He spent a significant amount of time studying the site, going there daily. These daily study excursions gave him an ample source of subject matter and objects as he began to further his knowledge of daily Roman life. At times, however, he integrated so many objects into his paintings that some said they resembled museum catalogues. During the next decade his output decreased, due in part to ill health but also to his obsession for decorating his new home where he moved in 1883. Nevertheless, he continued to exhibit throughout the decade and into the next, receiving a plentiful amount of accolades along the way, including the medal of Honor at the Paris Exposition Universelle of 1889, election to an honorary member of the Oxford University Dramatic Society in 1890, the Great Gold Medal at the Exposition Internationale des Beaux-Arts in Brussels of 1897, an in 1899 he was Knighted in England, only the eighth artist from the continent to receive the honor and the first in the past century. Additionally, not only did he assist with the organization of the British section at the 1900 Exposition Universelle in Paris, he also exhibited two works that earned him the Grand Prix Diploma. He also assisted with the St. Louis World’s Fair of 1904 where he was well represented and received. During this time Alma-Tadema was also very active with theater design and production, designing many costumes for various actresses which became all the rage in London. One of these dresses was made by Liberty’s of London and was popular both in England and in America. He also spread his artistic boundaries and began to design furniture, often times modeled after Pompeian or Egyptian motifs, illustrations, textiles, and frame making. His diverse interests highlight the immense talents of this artist. Each of these exploits were used in his paintings, as he often incorporated some of his designed furniture into the composition, and also must have used many of his own designs for the clothing of his female subjects. His popularity and prestige continued unabated until the latter years of his life. His last major composition was Preparation in the Coliseum of 1912 which was also his last entry into the Academy Summer Exhibition. In May of that year, he visited a spa in Germany to try to alleviate the symptoms of his sickness but they grew no better. He died there on June 28th, 1912. He was buried in a crypt in St. Paul’s cathedral in London. After his death World War I began and art such as Alma-Tadema’s was no longer appreciated as had been the case before. New movements in art had begun and his imagery, which was thought of as “Victorians in togas,” fell out of favor. An earlier article mentioned that “In the works of Tadema we are made to feel that they are composed of the same flesh and blood as ourselves,” (Cosmo Monkhouse, “Laurens Alma-Tadema, R.A.” Scribner’s Magazine, Vol. 18 (6), December 1895, pg. 664) initially one of the attractions of Alma-Tadema’s work, but the reception of his work by the end of his career had changed. Only more recently has Alma-Tadema’s work been reevaluated for its importance within the nineteenth century, and more specifically, within the evolution of English art. He is now regarded as one of the principal historicist painters of the nineteenth century whose works demonstrate the care and exactitude of an era mesmerized by trying to visualize the past, some of which was being recovered through archaeological research.